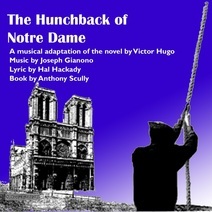 An original musical with music by Joe Gianono, lyrics by Hal Hackady and book by Tony Scully. ... Victor Hugo takes on the Church. He takes on the class system. He takes on the idea that reason is everything. His story strikes a blow for the transforming power of love. Almost all previous attempts to tell this story on stage have avoided its central issues and sugar-coated the tragic ending. When the story is told as Hugo wrote it, its power is cathartic and ultimately triumphant. The Archdeacon of the Cathedral of Notre Dame, Paris, 1482, is so obsessed with the Gypsy dancer, Esmeralda, that he brings about her execution as a witch when she rejects him. His foster son, Quasimodo, the bell ringer at the Cathedral, manages to save Esmeralda once, but is ultimately overpowered by the King’s guards, and in that struggle murders the man he had once revered. Throughout, the Gypsies provide passion, humor, and dance. What makes the story work; indeed, what makes it central to world literature is its celebration of love as the ultimate power we have.